Cats are highly bonded with their territory and don’t want to leave it. Ever. So expect this to be a somewhat stressful experience for your cat and plan accordingly. Here are some tips to help out. To make sure you get to your appointment on time, be sure you can find your cat. Start the search well in advance of your appointment. Cats seem to know when something is up. Always transport your cat inside a carrier. It’s not safe for you or your cat to have a cat roaming around free inside a car, and cats are generally much more comfortable and relaxed inside a closed carrier. We have some loaner carriers available at the clinic. Call for more information. Smaller carriers are better, as most cats feel safer in a small carrier. Secure the carrier so it can’t roll or tip over or fall off the seat. Seatbelts work well. One cat per carrier. 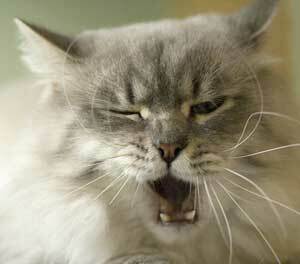 Even highly- bonded cats can get grumpy when stressed. Consider covering the carrier with a towel from home, as many cats feel safer that way. No need for water or a litter pan on short trips to the vet. They just spill and cause problems. Don’t transport cat carriers in the back of a pickup. It’s too scary. Provide absorbent bedding to soak up any accidents that may occur. Something with the familiar scents of home would be best. Cat carriers 101, choosing a carrier, training your cat to ride in the carrier, transporting your cat: 11 minutes or so. What to do if you haven’t spent the last 6 months training your cat to go in a carrier…. 1 ½ minutes.